One of the neatest things I’ve seen in the sports pages lately came last month in the Tampa Bay Times. To commemorate the one-year anniversary of the end of the 2011 baseball season – in which the Tampa Bay Rays clinched a dramatic playoff berth on the last day of the season – the Times retold the story of that day in comic book form. Where did the idea for a comic book narrative come from? I’m a big fan of comic narratives and have been looking for an opportunity to do one in our own paper. I have always done journalistic sketchbooks to report everything from the Super Bowl in Tampa to hurricane evacuation centers at the height of storms. A comic narrative to me was the perfect next step to retelling a news event in a dramatic and fun way. Problem has always been getting the time to do this. When this idea first came up, what was your first reaction? I brought the idea of doing a comic narrative for Game 162 with my good friend Curtis Krueger, a writer friend of mine at the Times. His beat is courts, but he is a big Rays fan. We started talking about this for a year ago about a week after the historic game. When spring training came around in March, we wanted to do it in our annual Rays season preview section. Problem was it was a look back – not a look forward, duh. So we aimed for the All Star break, but I couldn’t get the time to sketch due to some special projects, vacation and the usual news events that keep us from doing these types of enterprise projects. What about this story lent itself to being told in this format? 1. The biggest reason is that Game 162 was called the greatest regular season game ever played by baseball experts throughout the sports world. That made this an iconic event, especially to Rays fans immediately. 2. I listened to the game by radio because I couldn’t be near a TV. As a result, I pictured the whole game the way I used to when I was a kid. It made the game all the more memorable to me. The experience of listening by radio made the game take on a legendary feel to me right away. I grew up reading sports comics in the newspaper so I knew this would be a fun game to recreate with comics. It also would help me connect visually to the game. 3. Besides the breaking news and follow-up coverage of this amazing game and all the visuals that go along with that, highlights from the game were rehashed countless times throughout the year by the Rays organization and our own local media. This was another way to retell the story in a way fans could reconnect and celebrate anew on the one year anniversary. What was the drawing process like? Once we had a storyboard, the drawing part was fun – even with lots of pressure. Storyboarding is crucial because it allows the script and drawings to “dance” as one. By having the storyboard, I knew exactly what I was looking for in reference and what I wanted to do on the pages. Believe me, it’s not fun to sit down at a drawing board without a plan and even worse to get done and have to go back to redraw! The drawing process for this project was highly pressurized because I had only a week and a half to do all drawings and get them on the page so text could be refined and of course go through all editing stages. What’s the reaction to this been like, both inside and outside the newsroom? The reaction has been enthusiastic in the community and our newsroom. The online version was published on the Friday before it appeared in our Sunday paper and shared hundreds of times on Facebook. We overprinted the section and distributed it at the last game of the season to fans at the game. I have to admit, I was surprised at how surprised my Times colleagues were to see this type of storytelling in our newspaper. We have always prided ourselves at our willingness to tell stories in unconventional ways. Was there any thought into making this an interactive story? In the very beginning, we fancied making this an e-book and including video clips and audio interviews. That is our goal for the next time we do this. This reconfirmed to me that even with a very short period of time to produce something like this, it’s possible when everyone buys in on an idea and clears the deck to make its completion possible. 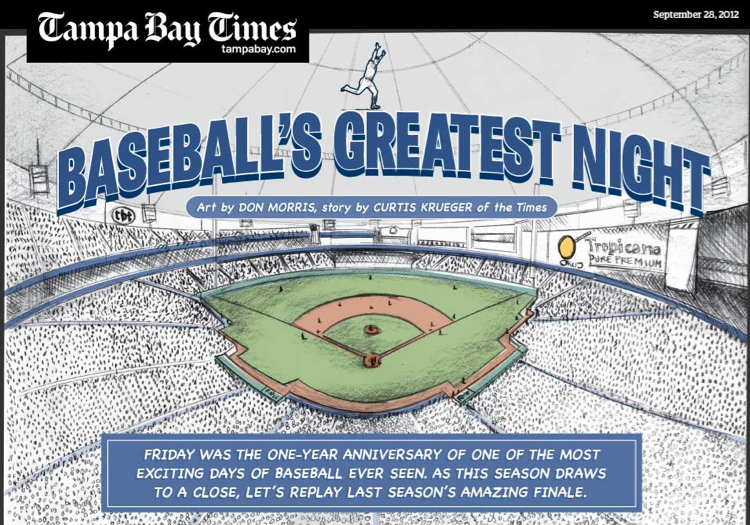 This project reinforced for me how special The Tampa Bay Times is as a place for telling stories in unconventional ways. Are you a comic book fan? If so, what’s your favorite? I’m not so much a comic book fan as I am a fan of illustrated stories. If it’s a good story and it’s illustrated and designed in a compelling way I love it. It doesn’t matter whether it’s in a book, magazine, newspaper or online. My favorite right now is Josh Neufeld’s “New Orleans After the Deluge” (Pantheon Books).